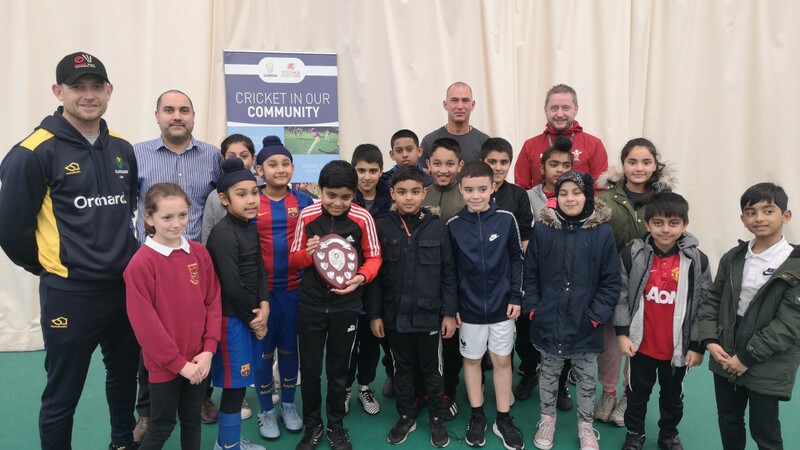 In a day full of action and keenly-fought games of softball cricket in the National Cricket Centre at Sophia Gardent, Kitchener Road Primary School retained the Riverside Challenge Trophy. Over the course of the past three months, pupils from Severn Road PS, Kitchener Road PS, Ninian Park PS and Grangetown PS have all been taking part in the indoor competition held at the home of Glamorgan Cricket, with a series of competitions specific to pupils in Years 4 , 5 and 6. Friday, February 8th saw Finals Day with 150 pupils drawn from the best players at each of the schools going head-to-head in the final held in the National Cricket Centre at the Sophia Gardens ground. After a gripping pair of semi-finals, the final saw a team from Kitchener Road meet a side from Severn Road with the former winning the contest. The presentation ceremony which followed the Final saw Graham Wagg, who is enjoying a Testimonial Year with Glamorgan in 2019 undertake a question and answer session with all of the pupils before the Trophy was presented to the winning side from Kitchener Road. “My congratulations to the winning side from Kitchener Road Primary School and I look forward to further competitions in 2019 and beyond as Glamorgan Cricket utilize their excellent facilities at Sophia Gardens to promote the playing of cricket.